Gough, Barry M.. "Tonquin". The Canadian Encyclopedia, 26 April 2018, Historica Canada. https://www.thecanadianencyclopedia.ca/en/article/tonquin. Accessed 25 April 2019. The Tonquin was a ship of 269 tons built in New York in 1807 and purchased 23 August 1810 by New York fur merchant and entrepreneur John Jacob Astor. The Tonquin was a ship of 269 tons built in New York in 1807 and purchased 23 August 1810 by New York fur merchant and entrepreneur John Jacob Astor. 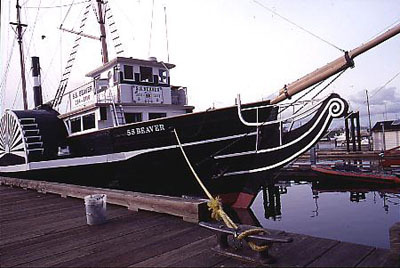 She sailed from New York on 6 September 1810, bound for the mouth of the Columbia River, where Astor's Pacific Fur Company intended to found a post and develop trade in opposition to the North West Company. The Tonquin's captain, Jonathan Thorn, was a brutal disciplinarian and had little use for Astor's traders. Clerk Gabriel Franchère's journal describes the captain's tyranny and disregard for human life, especially evident when the ship arrived on 22 March 1811 at the Columbia River mouth, where 8 sailors drowned attempting to take soundings. On June 5 the Tonquin sailed on a trading cruise from the new fort, Astoria. About June 15, evidently near Echatchet village, Templar Channel, Clayoquot Sound, Vancouver Island, she was seized by local Nootka Indians and most of those on board were slain. The next day, the ship either blew up or was blown up, perhaps by surviving crew to prevent her from falling into the hands of Indians, who had returned to attack the ship. The tremendous explosion sank the Tonquin, and with her went Thorn and Astor's hopes for dominance in the Northwest Coast trade.